PhD students should strive to complete their thesis within 3 years. 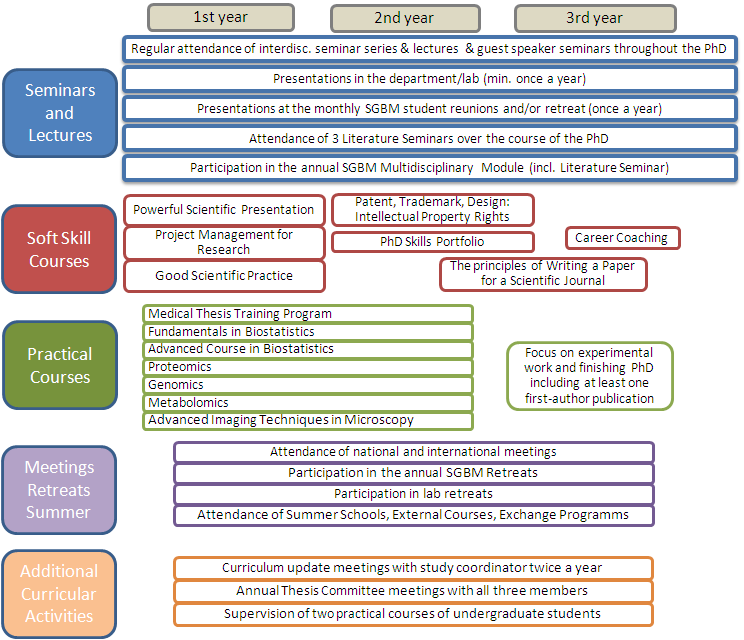 In addition to carrying out experiments for their thesis at the lab bench, all SGBM students have to complete a curriculum which should take up less than 20% of their time. This is to ensure an excellent all-round education. Each PhD student is supervised individually. Track 1 students (i.e. funded by the school) start by performing three rotations of one month each. At the end of this period they have a discussion with the management in order to decide in which of these three laboratories they will perform their PhD. Within maximum 6 months of starting their doctoral work, the PhD students (track 1 and track 2 alike) write a thesis proposal, and assemble a thesis committee to which they submit their thesis proposal. Thereafter there are yearly thesis committee meetings. Preceding each thesis committee meeting the students draft a short progress report in order to submit it to the committee members. In the monthly reunions students present their own work and learn to discuss it in a multidisciplinary context. SGBM students have a wide range of seminars, lectures, practical courses and soft skill courses to choose from. These different sections should be checked regularly for updates. Information regarding the MD/PhD program can be found under Application/Requirements.